Triangulum. © 2003 Torsten Bronger. 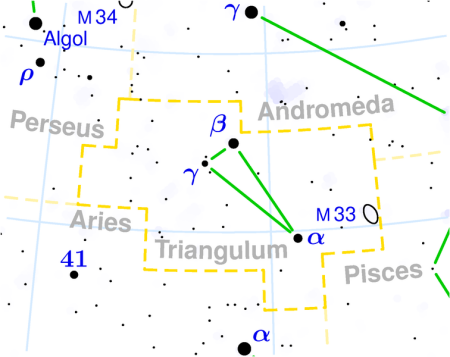 Triangulum (abbreviation: Tri), the Triangle, isa small northern constellation with a distinctive shape located at the southeast edge of Andromeda. Its prime deep-sky object is M33, the Triangulum Galaxy. See below for details of the constellation's brightest stars.